Some things you just can’t change. In our family Lemon Meringue Pie for Easter dessert is one of those. Before you believe there is some age old secret family recipe. . . well, then again, I suppose it is an age old family recipe, but it’s definitely not a secret. Cinnamah-Brosia serves this one at the Coffee Cottage, too. 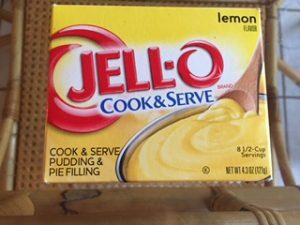 It’s really pretty simple, and the “secret” is right on the Jello Cook & Serve Lemon Pudding and Pie Filling box. To make this tasty dessert featured at the Coffee Cottage, just grab a box like the one pictured here and follow the directions on the package. Then indulge! In my humble opinion, coffee is an absolute must to cut the sweet rich taste on this one.